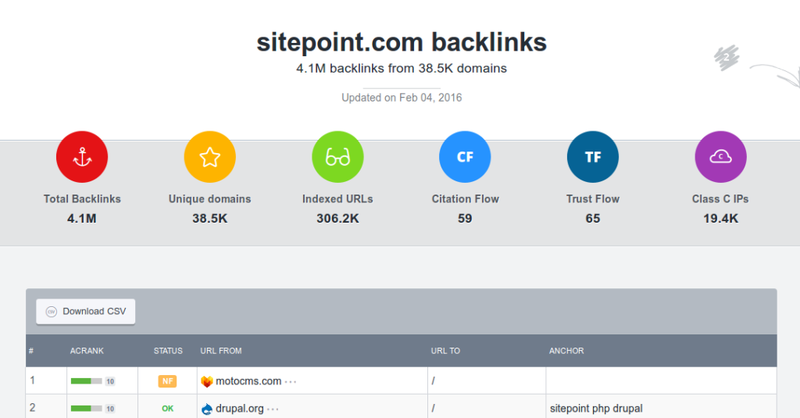 You've been doing a great job in backlinking but your results are disappointing. What could be wrong with your strategy? And how can you fix it? Even novice search engine optimizers know that backlinks are a crucial factor for SEO success. Most of us also know that it's link quality, not quantity, that matters. I assume that none of you are applying a bulk link building strategy, or worse, are paying for links. You do keep your link building act clean and don't do link schemes, but still find your rankings disappointing. Rankings can be disappointing in numerous ways. Of course, if you are not the top result for your keywords, it's obvious you can always do better, but is this a reason to label your rankings as 'disappointing' or 'frustrating'? Before we go on with the reasons why your link building results are frustrating, we need to clarify what 'frustrating' is. First, how do you define 'high ranking'? How high can you rank? Is this always being the top result for popular keywords? If you (or your clients) expect this and won't settle for anything less, then you really have a serious problem – with judgment. It's great when you are the top result for popular keywords, but in practice unfortunately this doesn't happen even to many top sites. Simply put, your expectations aren't realistic and no link building or any other SEO activity can help you achieve such high rankings. After you get realistic expectations about what you can achieve in search rankings, you need to sit down and think about whether you really have what it takes to get there. Yes, you could be number one for less competitive keywords. If you are OK with this goal, this is doable, so go for it. If you are aiming for more, sit down and analyze your chances. Only after you figure out what's realistic to expect, then proceed with the link building analysis. Think about what in your present link building strategy prevents you from reaching your goals. The most common reason why your thousands of backlinks don't work is that they are from irrelevant sites or pages. Even if these sites are high ranking, if they are not relevant to your site, these links don't help. In the best case Google just ignores them but in the worst case these links are used against you. It's really tricky to say what is relevant and what isn't. Since I don't know of any information straight from Google about how Google determines link relevancy, you need to use common sense in this. For instance, if you are linking to a WordPress template page, links from any Web design/development blog should be relevant. Of course, it's best if you link from a site/page that is only about WordPress, or even better WordPress templates. Some SEO experts speculate that Google has tightened their relevancy requirements and a link from a general Web design/development blog isn't that relevant anymore but since I don't know of anything from Google that confirms this, I suggest we don't believe it and simply disregard it. Your links might be relevant to your content but if the site they come from is a low quality one (as perceived by Google and possibly common sense criteria), this again could hurt your rankings. Long gone are the days when any link counted. Now, the rankings and the trustworthiness of the source matter a lot. Unfortunately, there is no universal definition of a low quality site. Generally a site with poor content and low rankings by Alexa, PR, and the other Web site ranking services is considered low quality for the purposes of SEO. One of the worst places to get backlinks from are link farms. However, even if the site is not a link farm, if it has tons of outbound links, this is bad for you. Another scenario with low quality sites is when a good site goes bad. It's quite possible that a site was good at the time they linked to you but later this changed. In such cases you might want to contact the Web master of the site and ask for the link to be removed. Alternatively, you can tell Google in your Google Webmaster tools to disavow the link from this site. If you think that when your links are from relevant, high quality sites only, you are safe, this isn't so. If your thousands of links come from a couple of domains only — even if they are high ranking and relevant — this can also hurt. The anchor text of a backlink is as important, if not more important, than the source of the link. When your anchor text has your keywords, this means a lot to Google. However, because of the importance of anchor text, it quickly got misused, even abused. This forced Google to change its algorithms and now it's safer to have a 'Click Here', or 'Check This', or your site's name as anchor text than to use keywords for all your backlinks. If a suspicious percentage of your backlinks have the same/similar anchor text, this screams manipulation and Google will penalize you. To be safe, use as diverse anchor texts as possible. The location of the link on the page also matters a lot. It makes a huge difference when the link is always in the footer (or the sidebar) and when it is in content. When the link is inside the page content itself and it flows naturally (i.e. it's part of the logical structure of the text and it doesn't look artificially placed there), this link is most valued because it's more unique. Similarly to domain diversity, one link in the content weighs more than hundreds in the footer and sidebar. Technical issues are frequently underestimated as a source of SEO problems. There could be technical issues with your site, such as frequent downtime, usability and accessibility issues, broken links, messed navigation, etc. that prevent the Google bot from crawling your site, thus hurting your rankings. This is why it's an absolute must to fix any technical issues you are aware of. On the other hand, there might be technical issues with the linking site that hurt you. These include again downtime, broken links, or simply links spiders can't/don't follow, such as nofollow links. In such cases the link simply doesn't exist for SEO purposes. Unfortunately, there isn't much you can do in this situation because you are not the Web master of the other site. The only consolation is that with really good sites technical problems are quickly taken care of, so if your backlinks are from good sites only, this should be less of a problem. Backlinks might be a very important ranking factor but they certainly aren't the only one. A great backlink profile can't compensate for deficiencies in other areas. For instance, if your site has huge on-page issues, such as low keyword density, or the opposite – keyword stuffing – or if you have excessive outbound links from your site, all this can't be compensated by top-notch backlinks. The same applies if for some reason your domain has been blacklisted. In this case, no link building effort can help until you figure out the reason for being blacklisted and deal with it. Finally, I must mention one more obvious factor for poor rankings – poor content. I assume we are not talking about poor content because if your content is subpar you shouldn't be having any dreams of high rankings, no matter how active your link building efforts are. I know you can find examples of sites with poor content and high rankings but basically this is not the norm and this formula shouldn't be working. Links might be a very important factor for good SEO rankings but when not done properly, linkbuilding not only doesn't bring results, but what's worse, it can hurt your rankings. There are many ways in which link building can go wrong. In this article I've mentioned the most common ones but unfortunately the list doesn't end here. You constantly need to watch for the status of your links because even without algorithm updates, it's quite possible a good link goes bad overnight and this can really hurt your rankings. If you get links from high ranking and relevant sites mainly, these links are inside the text, your anchor text is not spammy and the links come from diverse domains, you are on the right track. There is still no guarantee you will make it to the top but this seriously improves your chances of doing so.